Very seductive review, may have to read this one. Thanks DiDi! Please do. I’m sure you’ll enjoy it. 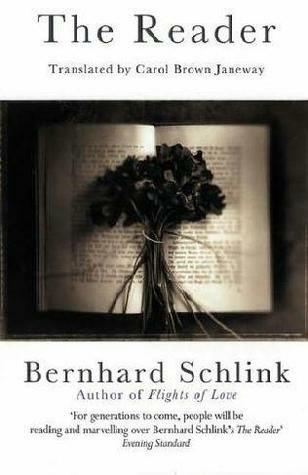 Bernhard Schlink brings up some interesting points concerning the collective conscience. Okay Deirdre since you have read and recommended this bookIi am going to read it! I actually work with adults learning to read and we viewed the film [“The Reader”] together, on DVD, last year. It was so poignant, and now I want to read the book and see the film, again. I loved the book although I’m not sure I’ll love the movie, but who knows. Will give it a try since I love what Kate Winslet does. Great review! It really looks like an intriguing book. Thanks! It was so much more than I expected. Well executed. I really enjoyed the movie and the book is on my TBR list too! VERY interesting. I have never heard of this book. I just might pick it up. This book was another surprise for me. It wasn’t at all as I expected it to be but a whole lot better. Beautifully written and full of emotion.